Leather is pale brown or natural with a slightly distressed look. 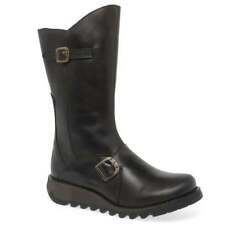 FLY London Ladies Brown mid-calf Boots Size UK8 EUR41 biker-style. I’ve found the original receipt for these boots. The colour and finish in the photos are accurate. FLY LONDON 'MASI' LADIES DK BROWN LEATHER WEDGE ZIP UP CHELSEA ANKLE BOOTS UK SIZE 6. Condition is New with box. These boots have never been worn. Fly London Ladies Red Leather Long Zip Boots Uk 5 Ref Ba14. Condition is Used. Dispatched with Royal Mail 2nd Class. The defects on these boots there is wear on heels, and some black dirt's marks. They need a good polish over. Women's FLY LONDON Ankle Boots. UK Size 5. UK Size 5. The boots are scuffed in places. London fly knee length leather boots, good condition. New listingFLY LONDON YAMA BLACK SUEDE PLATFORM WEDGE ANKLE BOOTS, UK 5 / EU 38, £90, VGC. Heel Type: Wedge Heel. UK 5 / EU 38. Sole: Gum Rubber. Colour: Black. Closure: Lace Up at the Back. Fly London Salv Purple uk 4 Mat Leather Ankle Boots. Very good Condition. Fly London Salv Purple Mat Leather size uk 4 ankle boots in very good condition. Selling as worn only once, and having a sort out. Sorry but UK postage only. Thank you. FLY LONDON LADIES BROWN LEATHER LACE UP PERT ANKLE BOOTS SIZE 6 WEDGE HEEL. I'll send them to you in a shoe box, but this most likely won't be the original Fly London box. Condition is used: I've worn these boots twice.They're amazing, but they're the wrong style for most of my clothes. Velcro strap across front to tighten. Very nice boots. Scuff marks on boots (not sure if this is design). FLY LONDON MES Women's Boots Brown Size EU 39 UK 6 Knee-high,zip, original box. Only Worn a couple of times. From a Smoke and Pet Free home. Dispatched with Royal Mail 2nd Class. Fly London YARG Brown Distressed Leather wedge Lace-up Boots. UK Size 5 EU 38 US 7.5-8 The condition is used but I think I only wore them twice if that,they are in very good condition. NO SIZE ON THEM. WE ESTIMATE THEM TO BE A UK 6. HEEL BLOCKS WORN - IDEALLY YOU NEED TO GET THEM RE-HEELED. CREASED TO BEND OF FEET AND LEGS. SCUFF AND FADING TO HEEL BLOCKS. SLIM FOOT INSTEP CIRCUMFERENCE TO BE ABLE TO PULL ON. Mid wedge heel - 2 " / 5 cm. dark olive / khaki green colour. grab a bargain. decorative buckle. zip to the side. Women’s Fly London Yarn Green Leather Wedge Heel Lace Up Ankle Boots Size 37. Condition is Used with very minor scuff marks. Have probably been worn under 10 times. Will be sent in a Fly London box however it is not the original box. Any questions please just message me. I do not accept returns. HEELS WORN ALMOST TO EDGE OF HEEL BLOCKS SO YOU SHOULD GET THEM RE-HEELED. CREASING TO BEND OF FEET AND LEGS. SCUFF TO HEEL BLOCKS AND TOES. SUEDE ANKLE AND HEEL AREA. GOOD CONDITION. Even despite close inspection we don't always find everything. FLY LONDON YAMA SUEDE LEATHER PLATFORM WEDGE ANKLE BOOTS UK 6 EU39 BNWIB RRP £99. Condition is New with box. Dispatched with Shutl 2-5 days. Well known Fly LONDON make. These are an unwanted gift. New in box. Grab a bargain! BNWOB RRP £89.99. THE COLOUR IS SLUDGE OR OLIVE GREEN. HEEL 2.5", PLATFORM BIT 1". MADE IN PORTUGAL, DESIGNED FOR COMFORT. ONLY TRIED ON AROUND THE HOUSE. Heel Type: Wedge/ Platform. Wedge heel. Pull on ankle boot.